Businesses that effectively communicate with consumers have a comprehensive marketing strategy that includes printed material. Comprehensive is the key idea for an efficient advertising plan. Digital and print media work hand in hand for maximum outreach. A marketing strategy is more successful when you implement printed material into the overall plan. However, simply adding printed pieces into the mix of your other advertising ventures, is not necessarily going to be productive; Quantity alone is not the answer. 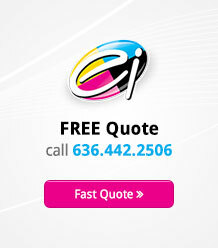 The following are three ways to obtain the greatest benefit from St. Louis business’ printing projects. The target audience dictates what printed material will be necessary. So determining who that target audience includes enables you to create the most effective material. You should also clarify what your aim is in reaching this group. These matters must be considered before beginning. There are at least three potential audience groups to target for printed materials. 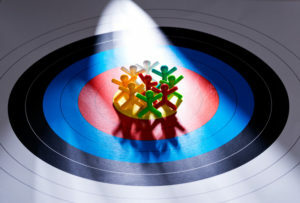 Most businesses have a customer base, and what you offer to this target group may be different from other customers. There is a range of printing choices that would effectively connect with this group. Business cards are a tangible reminder of your company. A recent study confirmed that people are more likely to remember something if they see it and touch it. S the next time the potential customer needs the service or product you offer, your business card will likely come to mind – it has already been seen and touched. Trade shows, conferences, seminars, and conventions provide rewarding opportunities for businesses to be on display, enhance their brand, and network with other professionals in their industry. At such venues, banners tell others who you are and garner attention in a crowded room. Once you have homed in on who your target audience is and you have selected the print materials that will work best to capture their attention, you should begin to consider the design and appearance of those materials. Printed products have the potential to engage your audience with textural features—so take advantage of that. The right design wins in its ability to draw in the customer. Customized printing offers many choices. Akuafoil: The akuafoil process involves applying a layer of silver ink beneath the regular colors, resulting in accents of glimmering metallic over the printed work. Lenticular: This printing effect simulates animation or changes its message when the individual moves the graphic from side to side. Foil Works: Brighten up business cards, postcards, and other pieces by gold, silver, and copper flecks of foil highlights. Pearl Metallic Stock: With pearl grains in the card stock, printed material will reflect a lustrous appearance when moved from side to side. Raised Ink: Upraised ink has a distinctly textural difference. The ink itself is manipulated instead of the paper stock (which is an embossing feature). Spot Varnish: By applying a varnish wash to only parts of a printed piece, the matte finish on the remaining portion gives a visually arresting contrast. Silk Lamination: The finished effect of silk laminated cards is durable, water-resistant, and elegant looking. Clear Or Frosted Plastic: These two options are both durable and modern looking, which makes them versatile and interesting across a variety of industries. The wide range of printing choices provides stunning material for all audience groups. Another important objective of the printing campaign effort is to educate your audience. While you obviously want to provide potential customers with basic information in the form of a business card or draw attention at a trade show, you should also have an array of other printed pieces which can inform and captivate both consumers and colleagues. Brochures: Traditional brochures offer a standard tri-fold layout; this set-up is geared toward educating the person due to its incremental delivery of information. In addition, the amount of space in a brochure is greater, making it easier to include narratives and charts or graphs. Presentation folders: Custom-designed folders bring depth to your product. Presentation folders give a comprehensive overview of your business to all audience groups. Business owners choose from an assortment of information to include in the folder. Postcards: Sometimes a company only requires a bite-sized piece of information to fulfill the need to inform – that is what a postcard delivers. Larger than a standard business card (and occasionally substituted for one), but much smaller than a brochure, the postcard has just enough space to inform customers of upcoming sales or educate consumers about new merchandise or services. Business printing is an important part of your overall marketing strategy: it gives businesses the edge by being able to effectively reach audiences. Going further, when you target your audience, you will have a better idea what printing materials will be best suited to the consumer. One of the most cost-effective ways to increase the ROI of your investment is to utilize all the different print options for your marketing materials. Draw your audience in through eye-appealing visuals and capture their attention. Once you have their attention, the printed material moves beyond the surface appeal to inform your audience and call them to action. By implementing these techniques businesses can gain the most from their printing investment.